The slogan appears on T-shirts and window decals at Sage International School, a Boise charter school. 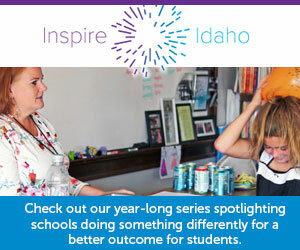 Weird or not, Sage is certainly an outlier among Idaho’s growing number of four-day schools. Based out of a converted Southeast Boise strip mall, Sage is growing rapidly and aggressively. The International Baccalaureate school has 1,100 applicants, and annual lottery parcels out a limited number of openings. In farm country less than an hour west of the Sage campus, Wilder’s Canyon-Owyhee School Service Agency Academy is another outlier. The alternative school receives students from five nearby high schools, and many arrive behind grade level. Teachers scarcely have enough time to cover the basics of a high school curriculum. COSSA’s schedule complies with state law, barely. Neither Sage nor COSSA fit the four-day school mold: the rural district hoping to save some money and reduce absenteeism. The two schools are shaped by their calendar — but are defined, starkly, by differing demographics. For Sage — which opened in 2010-11, with an inaugural class of 214 grade-school children — the four-day calendar represented a conscious business decision. Part of the motivation was marketing. Sage wanted to differentiate itself from Boise’s traditional public schools with a Monday-through-Thursday schedule. In 2015-16, Sage’s enrollment has grown to 921 students, from kindergarten through 12th grade. That leaves Sage still small enough to experiment, and executive director Don Keller is fascinated with the novel blended learning models that are emerging elsewhere in the charter school movement. “If I had my wish, I’d go three days a week,” he said. If Keller represents the true believer, COSSA CEO Harold Nevill represents the hard-bitten skeptic. COSSA didn’t go to a four-day calendar by choice; rather, it was thrust on the school in 2014. It came down to a simple enough vote; the academy serves five school districts, and three already operate on the four-day schedule. COSSA was moved to a four-day week in the interest of consistency. Nevill didn’t want to make the move. Neither did his teachers. “Alternative students need more time in educational activities, not less,” he said. After the Monday-through-Thursday classes, teachers at Sage spend Fridays learning. They’re on campus for a full work day devoted to staff meetings and professional development. Teachers learn the finer skills of their profession — such as “cold-calling” kids to engage all students in the discussion; going back to students, even repeatedly, to make sure they master concepts; and providing good, constructive feedback. Sage staff meetings are also used to figure out how to squeeze in the rigors of the IB curriculum, Keller said. IB course requirements exceed state requirements; for example, students must take a second language, at all grade levels. COSSA time management issues are more basic. First, teachers try to bring students back to grade level. They also have to squeeze the basics into a nine-week quarter. With the Idaho Core Standards, there’s no time for fluff, Nevill said. COSSA has to coordinate its bell and bus schedule around the five districts that bus students to the school. COSSA’s classes start after these districts start their day; COSSA must end classes in time to bus students back to their home districts before the final bell. COSSA will meet Idaho’s requirement for 900 classroom hours this year, with just six hours to spare. “We have to worry about snow,” Nevill said. For Sage and COSSA Academy students, Fridays are as wildly different as the schools’ prevailing demographics. Only 18 percent of Sage’s students qualify for free or reduced-price lunch, well below a statewide average that hovers around 50 percent. While their teachers work a full day, students have time to recharge. Some go on field trips with family. In the winter, students take advantage of powder days at the nearby Bogus Basin ski area. For Keller’s daughter, Fridays are a day to work on hunter jumping, an equestrian event. At COSSA, nearly 80 percent of students qualify for subsidized lunch. For many of Nevill’s students, a school day is a day when they get breakfast and lunch and a snack. On Fridays, he fears they go without sustenance and structure. “They’re lost to us,” he said. For many students, a three-day weekend means another day in a dysfunctional home setting. They may not get in trouble with the law, but many revert to bad habits and have to spend Mondays getting back into school routines. Friday extra-help sessions are out of the question, Nevill said. Schools won’t run buses to the Wilder campus — the four-day schools aren’t running buses that day anyway. And parents are unlikely to drive students to school. Keller doesn’t mince words about expectations. With the ability to spend one day of the week teaching educators how to teach, he expects Sage to be the best school in the state. By one metric, this spring’s SAT scores, Sage measures well. Its juniors averaged 1618, well above the 1550 score that connotes college readiness, and third highest in the state. Keller isn’t sure whether the scores reflect Sage’s demographics or a small sample size, since only 18 Sage students took the SAT. He’ll be curious to see how Sage fares when 100 or so students take the test. COSSA Academy’s average SAT score was 929, lowest among Idaho high schools. COSSA measures success in other ways. The key metric is a “positive placement rate:” What percentage of graduates stay in school, enlist in the military or find a job? In past years, a 20 percent rate was considered good. For 2014 graduates, before the shift to the four-day schedule, that rate was 73 percent. The upward trend continues — but not enough to change Nevill’s mind.